Coverage: Live on BBC Two Wales, HD, Red Button, the BBC Sport app, Connected TV and the BBC Sport website and live text on the BBC website. Ospreys have set their sights on a record fifth Pro12 title, regardless if they are considered underdogs in the play-offs. The fourth-placed Welsh region, who have already sealed their play-off spot, host leaders Glasgow on Friday. Ospreys backs coach Gruff Rees insists the four-time champions will be unaffected if some see them as outsiders for the title. "It doesn't bother us either way... We want to win the thing," he said. "We're fourth in the league and we've just got to fight to try and win a couple of games and see what happens. "We're comfortable in our own skin. We've got our own confidence about what we do. "We've got good opposition coming up but, if we play to the level we want to, we will be more than competitive." Leinster and Ospreys have won four Pro12 titles each, more than any other side in the competition's history. As the Irish province have missed out on a play-off place this season, they will be unable to add to their tally. 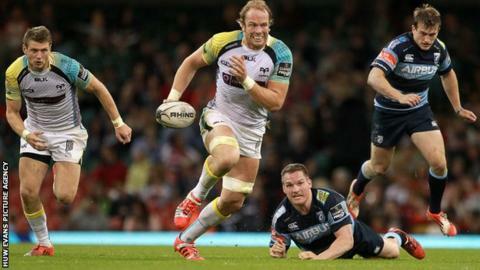 Ospreys have won their last four matches, with the latest coming against Cardiff Blues during April's Judgement Day double-header at the Millennium Stadium. With only four points separating Ospreys and Glasgow with two games left, the Liberty Stadium side could still secure a home play-off semi-final by finishing the regular season in the top two. "There's a good balance of inexperienced but talented youngsters led well by world-class talent and people who know what it takes to win rugby games," said Rees. "That's carried us through, knowing we could get to this point. Knowing the characters we've got, we won't settle for this [being in the play-offs]." Ospreys: Dan Evans; Jeff Hassler, Ben John, Josh Matavesi, Eli Walker; Dan Biggar, Rhys Webb; Nicky Smith, Scott Baldwin, Aaron Jarvis, Tyler Ardron, Alun Wyn Jones (capt), James King, Justin Tipuric, Dan Baker. Replacements: Sam Parry, Marc Thomas, Dmitri Arhip, Rory Thornton, Dan Lydiate, Tom Habberfield, Sam Davies, Jonathan Spratt.